You Must Feel It – Part 2 | Mediterra - Swim & Run Better Than Ever! In both rehearsals and often in drill mode you can turn your head and watch what is happening with that body part . Or you might stand in front of a mirror or window. Or you might watch your shadow on the bottom of the pool. 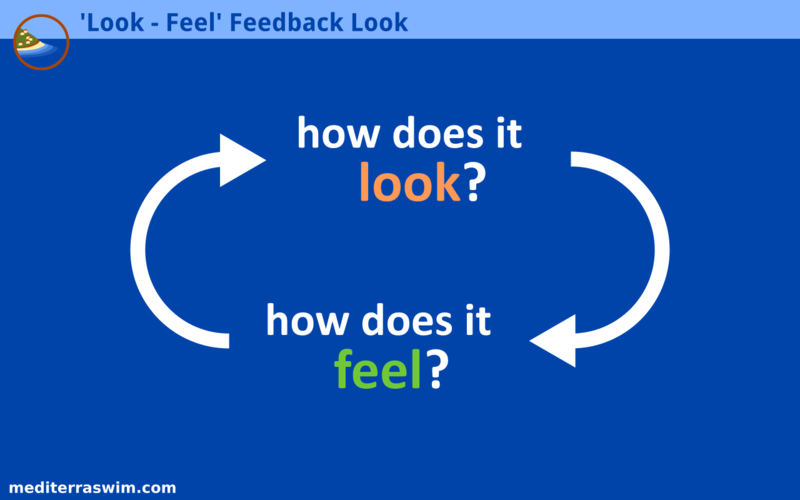 You can start with visual feedback to assure yourself with external information that you are taking it closer to the ideal. But at some point you need to turn off the visual input and tune in more carefully to how it feels. This is when the water changes from your opponent to your partner. The water is surrounding you and pushing against the nerve receptors on the surface of your skin. You can feel your lead arm slide straight forward or angled poorly. You can feel more or less pressure form behind your forearm during the catch with a certain shape. You can feel and hear splashes of waves you create with your entry or kick. You can hear the sound of water flowing past your ears change pitch as you accelerate or decelerate. You can feel the surface of the water with your fingernails as you swing the recovery arm forward, or notice that your hand is nowhere near the surface. You can feel the ease in the shoulder when the recovery arm swings forward along the safest path, and the tension when it does not. You can feel when the legs are straight behind, hidden in the shadow or the torso, or when they are bent and hanging below. You can feel tension in the neck when it is held stiff or tilted upward, and the relaxation when it is left in neutral position. Focal points are where intentionally you direct attention upon some part of the body that you can control. In order to control that part you have to feel that part and its relationship to other parts of your body or to the water directly. The more the focal point is phrased in sensory terms the more easily you’ve be able to use it to control your body by how it feels. Weightless head refers to how the head feels when fully released, and fully supported by water pressure pushing up against your face. This is something you can feel. Contrast that to ‘eyes looking down’ – this requires you to reference something outside your own body to know where ‘down’ is. Ragdoll or lazy forearm refers to the feeling of having all the muscles in the forearm and hand turned off during the recovery swing. This is something you can feel. Contrast that to ‘equilateral triangle’ arm shape – this requires you to form your recovery arm into a triangle shape (using the surface of the water as the third side), but you cannot see (you should not see) your own recovery arm as it is swinging forward to confirm that it has this characteristic. There are so many useful focal points and only some of them can be put in purely sensory terms, but you can see the difference between those that will be easier to feel ‘better/worse’ and those which will require you to do some additional work to build a sensation to go with them.